I’m guessing that you clicked-through to this article because you are looking (have looked) at your chest, and have noticed it’s not quite the same as everyone elses? You can see that it either sinks in or sticks out, or a combination of the two. There may be a bit of a twist in your chest / spine also. “Why is this?”, you may be wondering. Before I go into the why, you may also be wondering if there are any medical terms for the way your chest looks. Well, when the middle of the chest sinks in, it is called Pectus Excavatum and when the chest sticks out it is called Pectus Carinatum. Like I said, some people can have a combination of both (plus with a twist in the rib cage and spine). Everyone is different. What causes this to happen? Well, in short, nobody really knows. But there is always a reason to everything. One short answer I can give you now is that it may have been caused by a nutritional deficiency in your parents (from not having the best of diets) and / or toxicity in your parents (such as having lots of mercury fillings) at the point of conception. Whatever the reason, it is not what to focus on now. What you do have to focus on, is what are you going to do about it? 6 Magnetic therapy (for Pectus Excavatum only). This is very new and in its experimentation phase. It is best to use a combination of the first two or three options, to start with. If you want to start with trying to improve the look of your chest with just exercise, you can get hold of my book Pectus Free Without Surgery. I have improved the way my Pectus Excavatum looks with exercise, so I put a book together in 2007 sharing the exercises I have used. Even people with Pectus Carinatum can benefit from using it, in regards to posture and opening up the ribcage. But people with Pectus Carinatum really do need some bracing support, as they need some sort of external pressure to push their chest back, so to speak. Brazil– with Dr Sydney A. Haje. He was the first person to develop bracing support for people with Pectus, over 30 years ago. America– with Joe Percello. Joe has been helping people mainly with Pectus Carinatum since 1996. United Kingdom– with Sam Walmsley at the The London Orthotic Consultancy clinic. They are now using Dr Sydney A. Haje’s bracing techniques (since 2010). They say that with Pectus Excavatum it is 20% bracing, and 80% exercise. And with Pectus Carinatum it is 80% bracing and 20% exercise. Below is a short video on how Dr Sydney A. Haje’s bracing work has come over to the UK. Sam is briefly mentioned at the end. In this two-part video series Dr Sydney A. Haje talks about his lifetime’s work with the Pectus conditions. Here is a new kind of brace for people with Pectus Carinatum. Vacuum Bell therapy is only needed for Pectus Excavatum as it helps to pull the chest outwards. It was invented by a man called Eckart Klobe in Germany. 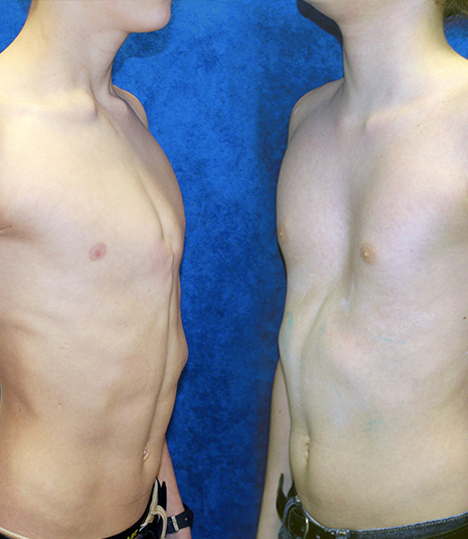 The combination of exercises, bracing support and Vacuum Bell therapy can really help those with Pectus Excavatum. The surgical methods to correct Pectus Excavatum and Pectus Carinatum have improved over the years (just like most surgical procedures). In the past the surgery was a lot more brutal, but now it is much less invasive. Having surgery can bring around faster results, but they are not always as long-lasting as some surgeons make out, especially if the individual is going through a long growth spurt. Plus you may end up on pain killers for up to a year afterwards, which is not good for the digestive system, or the body as a whole. However, if it’s do or die then surgery is obviously the best (only!) option; for example, if a person will die within three weeks if they do not have their Pectus Excavatum corrected. But I have never heard or seen a case of Pectus putting someone in that situation. 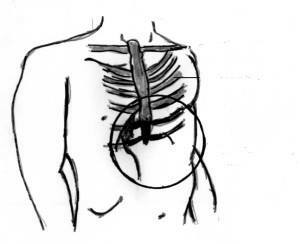 Surgery may also be a better option if a peron’s Pectus Excavatum is unbelievably severe and they don’t have the patience to use exercises, bracing support and / or Vacuum Bell therapy. But they could still use exercises after surgery to make sure their chest retains its new shape. The video below shows you the newer, less invasive Nuss procedure surgery (for Pectus Excavatum ), in action. This type of procedure is mainly used for Pectus Excavatum. Having someone fill your chest with x-amount of silicon, which can be hugely expensive, is not a great idea. This type of therapy is very new, and is being tested out in America. It is almost like a combination of surgery and bracing. It is only used for Pectus Excavatum. I only came across the video (below) for this new type of procedure as I was writing this blog post. It’s a great idea, but it’s still a little more invasive than bracing support and Vacuum Bell therapy. Like any kind of corrective therapy / treatment, you should always go for the most natural, minimally invasive procedures first, which are always more affordable, and usually more cost-effective in the long run. Only if they do not work, should you look into surgery / more invasive procedures.